Most dealerships only care about you until you roll off the lot. Not Al Packer's White Marsh Ford! We help you save from the moment you walk into our dealership and long after you've bought your vehicle. 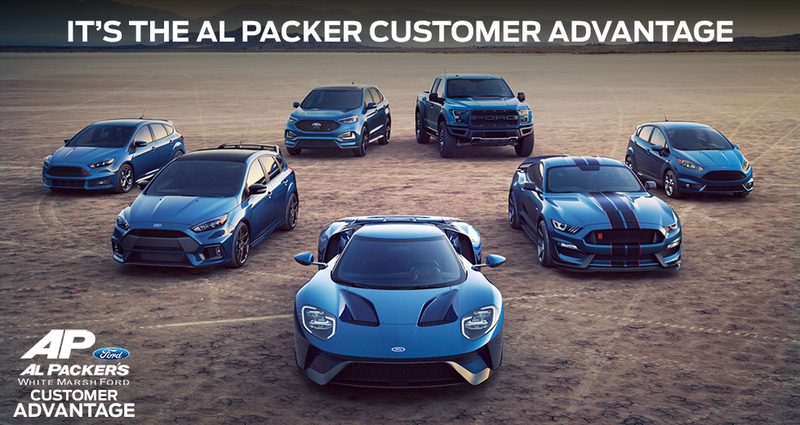 It's all part of the Al Packer's White Marsh Ford Customer Advantage. From routine maintenance to special amenities, we've got you covered with a variety of benefits! FREE 27 Point Maintenance Inspections! Saving on your car is great. Saving after you drive off the lot is even better! Visit Al Packer's White Marsh Ford today and take advantage of the Customer Advantage on your next Ford! *Limit 6. Expires 2 years from delivery date. Diesels & Synthetics are $20 off in lieu of free. ** Exterior only. *** Only1. Expires 2 years from delivery date. ****Vehicles with more than 4 tires excluded. ***** Within 5 mile radius of dealership. Fleet and Commercial vehicles excluded from the Customer Advantage Program.